U-turn: Osborne will, after all, cap the cost of payday loans. What’s made him change his mind? Announcing a major and politically significant U-turn, George Osborne said the cap on the overall cost of credit was the next logical step as the coalition sought to regulate what had been a wholly unregulated market. The timing of the U-turn led observers to conclude that politics as much as policy had driven the decision. Both the government and the regulator the Financial Conduct Authority (FCA) had been resisting the move despite strong pressure from Labour and individual Tory MPs eager for their party to be doing more to be seen on the side of hardworking people. Only last month, the FCA said there was no need for a cap and the issue had been referred to the Competition Commission for further discussion. 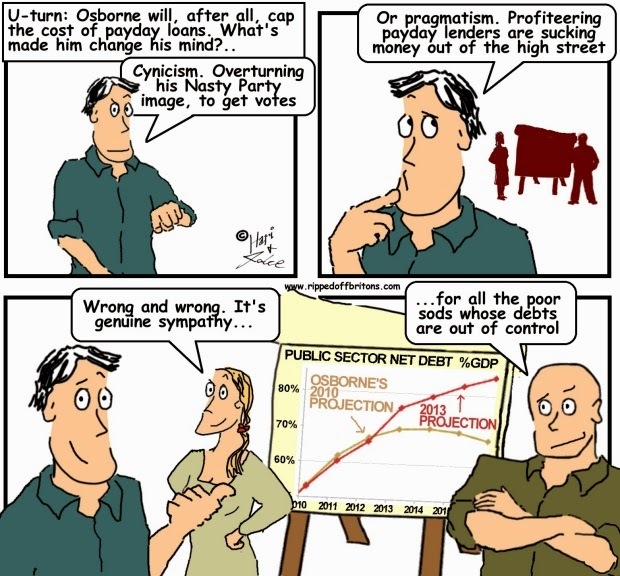 SOURCE SPECTATOR: Budget 2013: Six Scary GraphsThe Chancellor started by saying the debt would plateau by the 2015 election. But debt is up 38 per cent under the coalition so far, and is set to double.